Well I have been missing for a couple of weeks and now I’m back. I was away doing an Intermediate Copic Designer Certification course one week, and then last week I was not so well (which got worse over the weekend). Anyway here I am and my desk is a bit of a mish-mash of stuff. I have some class kits ready to be made-up, a page about Sue ready to photograph before taking it to work, the usual tools/etc, a pile of photographs that I had printed yesterday, a new 6×6 paper pad from Cosmo Cricket, some scraps from the page about Sue, in my basket of new goodies there is a new Suzi Blu stamp I am just busting to try and my new super-sized box of Zots is sitting in its new home next to my tools basket. And the other side of the desk is piled-up with deadlines and like-to-do’s, as usual. I received my WOYWW 2nd Anniversary PiF Gift all the way from the UK from Kirsty. The most lovely pair of earings displayed on a beautiful card. I have to keep them away from Naomi-Jon as she loves them too. 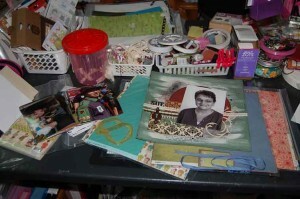 I posted a pic here of the PiF gift I sent to Spyder (Lyn) in the UK, that has now arrived too . 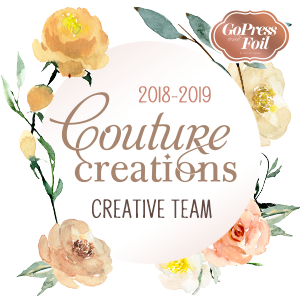 So now I would recommend you pop on over the Julia’s Blog and then you can visit some other creative desks and maybe pick-up some good ideas along the way. 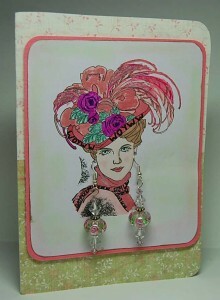 Love those earrings, and the card! I’ve seen so many gorgeous pifs on here over the last couple of weeks. And wots a zot?? Great post – fabulous gift indeed! Great that you have done that course – looking forward to seeing your creations. So glad you liked the earrings and they arrived in one piece. The PIF was such great fun, wasn’t it? Love your pif gift what great wya to display those earrings.Your gift sent to Lyn is goprgeous too.Have fab creative week hope your copic course went well?! 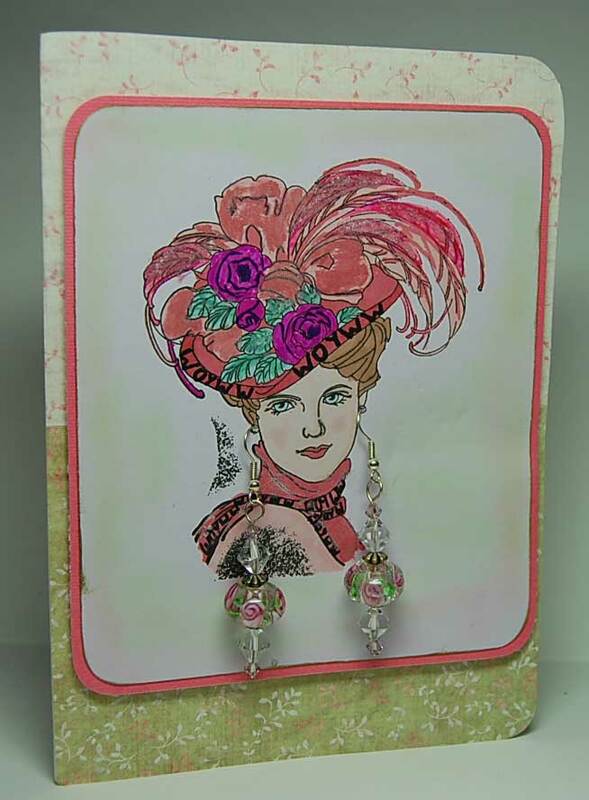 You must be delighted with your Pif gift so clever to display the earrings on the card. What a fantastic PiF! 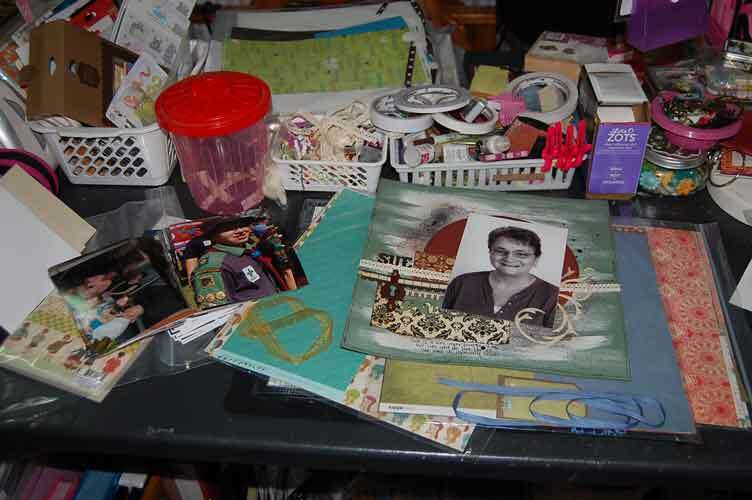 So much happening on your desk – love it! What a dainty pair of earrings! So pretty!